How to Apply Online on trjdc.cgg.gov.in: Online applying procedure for TSRJC CET 2019 and Steps to be followed in submission of the application through ‘Online’. TSRJC Entrance Test 2019 notification to be issued on 27-02-2019 by TREI Society officials and invites online applications from the eligible students. The CET will be conducted on 10-05-2019. TS Jr Colleges CET for admission into Inter first year in TS Residential Jr Colleges. 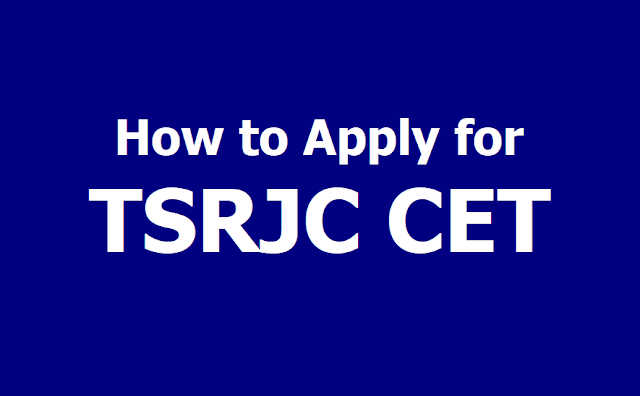 1 The candidate shall first go through the information bulletin carefully and satisfy their eligibility for appearing for TSRJCCET 2019. 2. The candidate after satisfying himself/herself about the eligibility criteria for the submission of application through online shall pay a fee of Rs.150.00 through APONLINE or through Credit card(Payment gateway) from 11-03-2019 to 15-04-2019 for submission of application through Online. 3. At the APONLINE CENTER or PAYMENT GATEWAY (By Credit Card @tsrjdc.cgg.gov.in) the candidate has to give the required preliminary data (i.e. Name of the candidate, Date of birth and mobile phone number). 4. On receipt of fee at APON LINE,or PAYMENT GATEWAY, the candidate shall be issued with a Journal Number’ with which she/he can proceed with submission of application through online through the website http://tsrjdc.cgg.gov.in. Issue of Journal Number does not mean that the candidate has completed submission of application online. It is only a confirmation of the fee received. 6. The candidates shall follow the procedure for submission of online application as given in the ‘Information Bulletin’ and also as per the instructions provided online while filling up the online application form. The Candidate should be ready with the SSC Hall ticket Number(SSC-2019) before filling in on-line application. On entry of SSC Hall Ticket Number, the data of candidate ( name, father name, mother name, date of birth, Photograph, Signature) will be captured from the SSC Nominal rolls available with SSC Board. In case of the candidates not appearing for SSC Board exams i.e. the candidates appearing for CBSE or any other Board exams, such candidates should be ready with a photograph of size 3.5 X 4.5 cms. The Photo should be scanned and uploaded along with the application form for such candidates. 7. While filling the on line application, the candidate has to opt the course. Once a course is opted, that can not be changed. 8. The candidate need not posses any certificate at the time of apply, but the candidates must obtain original certificates (Caste, Income, Study, Special category) by the time of counselling. 9. On submission of Application ONLINE, the candidate has to take a copy(print) of application form in which a reference number also be given. This Reference number is required to download the Hall Ticket. The copy of online application is to be preserved for further reference. 10. For any mistakes/incorrect information, the candidate is solely held responsible. Hence, they must take utmost care while filling the online application. 11. The Applications of the ineligible candidates will be rejected Summarily. 12. The selected Candidate should be able to produce the original certificates at the time of admission as a proof to the information furnished in the application. 13. The selection of the candidate will be summarily rejected if they fail to submit the necessary documents at the time of admission. http://tresidential.cgg.gov.in from 01-05-2019 to 10-05-2019 with the reference number allotted to them. 2. Candidates have to download the hall tickets from the website only. No printed hall ticket shall be issued/posted to the candidate. 3. Request for issue of duplicate Hall Ticket will not be entertained. 4. Without hall ticket, no candidate will be allowed to appear for the examination. 1. The candidates are personally held responsible for incorrect information in the application form. 2. The convenor reserves the right to cancel the admission at any stage, if the particulars furnished by the candidate are found incorrect or against the rules of admissions. i. The higher marks secured by the candidate in Mathematics for MPC, Biological Science for BPC and Social Studies for MEC/CEC will be considered. ii. If still the tie persists, the higher marks secured by the candidate in Physical Science for MPC and for BPC, Mathematics for MEC/CEC will be considered. iii. If still the tie persists, it will be decided by taking advanced age as criteria. vi. The information furnished in application by the candidate will only be considered and registered and if any candidate fails to fill the complete information or given wrong information, the fault lies with the candidate only.